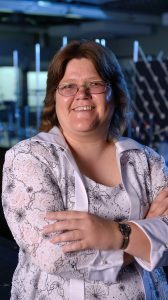 Following glowing letters of recommendation from students, parents and colleagues, University of Mississippi Chemistry Professor Kerri Scott has been chosen to receive a prestigious honor for her exceptional service. The Thomas Frist Student Service Awards are presented annually to one faculty member and one staff member for going the extra mile in dedication and service to students. Examples of exemplary service include student guidance and mentorship above and beyond those expected of faculty and staff as part of their job responsibilities. Kerri Scott, instructional associate professor of chemistry and biochemistry and associate director of forensic chemistry, is the faculty honoree. “Our university is truly a special place because of our steadfast commitment to student engagement and success,” Chancellor Jeffrey Vitter said. “Across our campus, we have exceptional faculty and staff who go above and beyond to put our students first. Any full-time faculty or staff member, except previous winners, is eligible for the award, which includes a $1,000 prize and a plaque. They will also be acknowledged May 12 during the university’s main Commencement ceremony. “We had an outstanding group of nominees with many deserving nominees in each category,” said Brett Cantrell, assistant professor of accountancy. “For the faculty award, Dr. Scott stood out for the impact her advising had on students not just academically, but intra-personally. The Frist Student Service Awards were established with a $50,000 gift from the late Dr. Thomas F. Frist of Nashville, a 1930 UM graduate. Previous winners of the Frist Award include faculty members Luca Bombelli, Denis Goulet, Aileen Ajootian, Don Cole, Charles Eagles, Ellen Meacham, Terry Panhorst, Ken Sufka, Eric Weber, Donald Dyer and Robert Brown; and staff members Anne McCauley, Carol Forsythe, Thelma Curry, Dewey Knight, Valeria Ross, Marc Showalter, Linda Spargo and Whitman Smith. See https://news.olemiss.edu/university-honors-three-employees-frist-service-awards for the original story by Edwin B. Smith.